Despite the cold snap of the past few days, it’s almost spring in Arizona and that means temperatures are going to creep higher and higher, and we know what that means. It means we’ve got to make sure our home and vehicles are ready for Arizona’s extreme high temperatures. The average high temperatures in March are between 74 and 82 degrees. In April, the average highs are 83 to 89 degrees, and by May, you know we’re hitting triple digits regularly. But, inside your car, the temperatures are MUCH higher: According to www.heatkills.org, even at just 70 degrees on a sunny day your car interior car temperature can reach 104 degrees in 30 minutes. After an hour, that number soars to 113 degrees. When we’re in the peak of summer, with 100+ degree days, the inside of a parked car in direct sun can reach as high as 172 degrees! At Desert Car Care McQueen, our technicians and mechanics know you want to flip on the AC in your car and immediately feel a nice cool breeze chilling the inside of your vehicle. One thing to help that process along is to set your AC at its lowest setting, and crack the back windows slightly. 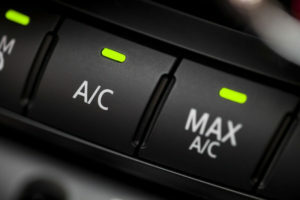 When you turn on your AC to max, it actually is recirculating the air inside your car. We guarantee that in the summer months, it’s cooler outside your car than inside. Give your cooling system a break and let it cool the outside air for the first 5 minutes when you turn it on, then you can switch to the maximum setting. Cracking the back windows slightly allows the heavier, cooler air to push out the lighter hot air to help reach a chilled temperature sooner. Your A/C system also has hoses and refrigerant charging ports. So, if it’s not cooling correctly, then it is likely that something is amiss in one of these main parts. Our technicians can use dye to determine if there is a leak and precisely where it is. We will also check all the major components for wear and erosion, and to ensure all are working properly. So, before the hot weather arrives, take few minutes to schedule an appointment to have your system checked out, and hey, why not get the oil changed, too. At Desert Car Care McQueen, we know that an ounce of maintenance prevents several dollars in repairs.